Images made with the Very Long Baseline Array (VLBA) radio telescope show the mysterious X-ray nova in Scorpius as it ejected blobs of material at tremendous speeds over the period from August 18 to September 22, 1994. Some of these blobs appear to be moving faster than the speed of light -- an illusion created by both the great actual speed of the blobs and their direction of travel with relation to the Earth. This object was discovered by the Compton Gamma Ray Observatory and given the name GRO J1655-40 on July 27, 1994, and has been observed both with the Very Large Array (VLA) and the VLBA. 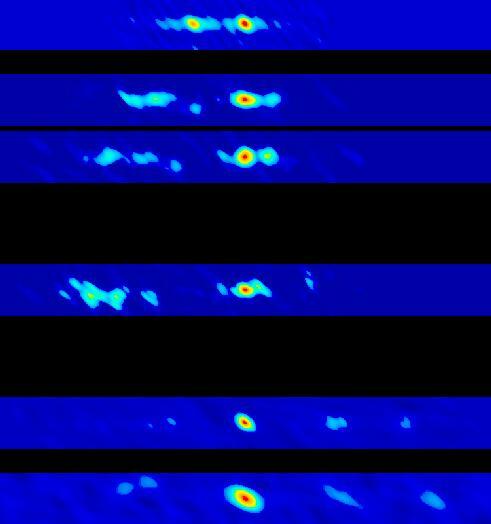 The great resolving power of the VLBA, demonstrated by these images, has allowed astronomers to track individual blobs as they move away from the object's core. The VLBA and VLA are funded by the National Science Foundation. The VLBA observations were made by Robert Hjellming and Michael Rupen of the National Radio Astronomy Observatory. There are two renditions of these images -- a pseudocolor version and a black-and-white contour map with annotations. Both renditions are combinations of VLBA images made at different times. In these combinations, earlier images are higher and later images are lower. The vertical spacing of the images indicates the relative time spacing between the images. The radio core of the X-ray nova is the bright object at the center of each image. The B&W image contains the date of observation for each image. The vertical line indicates the core, while the sloping lines connect separate observations of individual blobs. The numbers in these lines indicate the motion across the sky (proper motion) of each blob, indicated in milliarcseconds (mas) per day. At the distance of this object, about 10,000 light- years, proper motion of about 50 milliarcseconds per day corresponds to the speed of light. The apparent speeds of the blobs range from less than half the speed of light to 130 percent of light speed. The blobs are not actually moving faster than light, but are moving at speeds approaching that of light, which travels at 186,000 miles per second. The great differences in speed among the blobs and the detailed structure seen in the VLBA images are tantalizing to astronomers. The VLBA images of GRO J1655-40 are the first ever seen at such great detail for a galactic relativistic jet. GRO J1655-40 is thought to be a double-star system with a superdense neutron star or black hole as one of the pair. Astronomers believe that, in systems like this, the central object (the neutron star or black hole) is pulling material from its more- normal companion star. This material, drawn by the strong gravitational attraction of the central object, forms a disk of material orbiting that object. Such disks, called accretion disks, give rise to a variety of phenomena, most of which are poorly understood. Heating of the material within the accretion disk is thought to be the cause of X-ray emission from the system. The accretion disk also is thought to generate jets of subatomic particles ejected at great speeds roughly along the polar axis of the rotating disk. In outbursts, heavier concentrations of particles are ejected and the interaction of these ejected particles with internal magnetic fields produces the strong radio emission detected by radio telescopes. GRO J1655-40 is the second such powerful object discovered within our own Milky Way Galaxy. The first, called GRS 1915+105, was discovered in 1994 by researchers using NRAO's Very Large Array (VLA) radio telescope. GRO J1655-40 is closer to Earth that the other object and its behavior is much more complicated, making interpretation of the observations more difficult and scientifically more interesting. Jets of material moving at speeds nearly that of light, such as seen in GRO J1655-40, are seen in distant galaxies and in far- distant quasars. Those jets are believed to be produced by accretion disks surrounding black holes. The black holes in radio galaxies and quasars, however, are millions of times more massive than the sun, while the two objects within the Milky Way producing such jets have central objects with masses at most a few times that of the sun. The proximity of the objects within our Galaxy and the ability of high-resolution instruments such as the VLBA to observe them in detail means that these objects may allow astronomers to resolve some of the many questions that remain about the physical processes that produce relativistic jets throughout the universe. The VLBA and VLA are facilities funded by the National Science Foundation. Photo Credit: Robert Hjellming and Michael Rupen. Courtesy NRAO/AUI.